Our designers work along with you to obtain something totally unique. We always develop an understanding for your requirements and will work with you to ensure the final product is elegant as well as of best quality. Let the magic of happiness begin with elegant cards!!! Looking for a company who is reliable, affordable, who provides excellent customer service? Then please take few minutes of your precious time to read what our valuable customers say about us !!! An awesome collection of traditional Hindu wedding cards created by our designers with new technology quality printing. 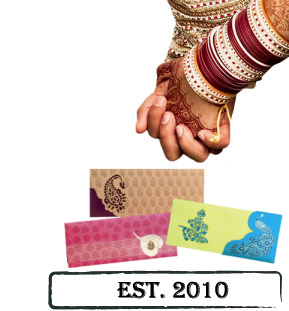 A wide range of Sikh wedding cards specially designed with an amount of elegance and richness of your dream. The finest and unique collection of Muslim wedding cards with attractive colours and remarkable designs. An exclusive selection of Interfaith wedding cards with exceptional, smart and contemporary designs.